The Wednesday morning session of the 74th UE Convention on August 19 discussed and voted on a series of resolutions. Secretary-Treasurer Andrew Dinkelaker also gave a detailed financial report and answered delegates' questions on the union budget. The policy resolutions dealt with were: Effective Collective Bargaining, Independent Political Action, Protect and Improve Our Retirement Security, Healthcare for All. The convention also heard, discussed, and approved the Report of the Policy Action Committee, which selects major priorities for the entire union to focus on, from among the many policy resolutions. The policy action program adopted at the convention focuses on independent political action, healthcare and retirement security. On the collective bargaining resolution, Local 506 delegates Scott Slawson, Matt McCracken, Ricky Steele and Mike Ferritto, and Local 601 delegate Fred Harris, talked about national negotiations with GE earlier this summer. Following the meeting of UE-GE delegates with GE workers from Italy the previous day, Slawson said, “Maybe it’s time to look at global unions” to deal with global companies. Cettina Costagliola, Local 255, said her local has seen a big attack on healthcare, and Marie Lausch said all 60 bargaining units in Local 222 are facing attacks on benefits. Larsene Taylor, Local 150; Mike Rivera, Local 1421; and Charlene Winchell, Local 1121, also spoke on the resolution. Speaking on “Independent Rank-and-File Political Action,” Scott Slawson warned of the threat of the TPP trade deal. Elizabeth Nikazmerad, Local 255, offered two amendments to the resolution, one to equally blame Republicans and Democrats for union busting, and the other to remove a favorable mention of Bernie Sanders. After several delegates spoke for and against, each amendment failed. Also speaking on the political action resolution were Angaza Laughinghouse, Local 150; Peter Knowlton, Northeast Region; and Cettina Costagliola, Local 255. Following approval of the political action resolution the convention went into a closed session in which Secretary-Treasurer Andrew Dinkelaker gave the financial report. 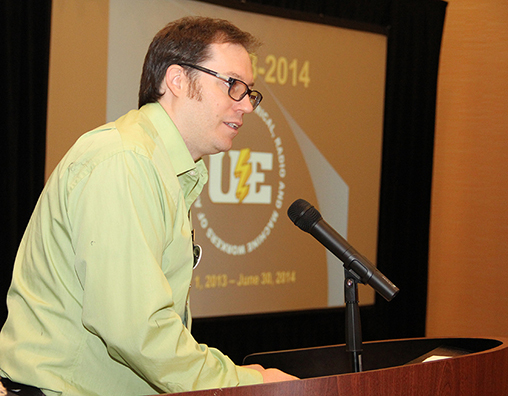 Matthew Braddon, Local 222, thanked delegates for thinking about the future of young workers. Also speaking on the resolution were Mike Ferritto; Joni Anderson, Local 1107; Marie Lausch and Scott Slawson. Also speaking on the healthcare resolution were Leo Grzegorszewski and Matt McCracken, Local 506; Dolores Phillips, Local 1118; Sharry Niedfeldt, Local 1161; Bonita Johnson, Local 150; Phil Dedera, Local 1177; Ron McCollough, Local 155; and Brandon Dutton, Local 1161.